Signup for receiving new recipes, offers, freebies and products in your inbox! Thank you for your interest in joining our subscription list! To complete the process, please check your inbox for the email to confirm the subscription. Homemade pasta sauce using fresh tomatoes or specifically saying homemade spaghetti sauce recipe using fresh tomatoes can be made from scratch easily using fresh tomatoes and your favorite spices. A little amount of good quality spaghetti sauce can make your pasta taste great and you can easily buy the spaghetti sauce online or you can make the spaghetti sauce fresh at home using fresh ingredients like fresh tomatoes and spices. If you like tomato chunks in your pasta sauce, the making is much easier. This is a quick homemade pasta sauce recipe using tomatoes without onions, if you wish to add onions, you can chop one large onion finely and saute it really well before adding the tomatoes. If you want the sauce to be more of a smooth texture, you can puree a couple of tomatoes and cook along with the tomato sauce that we are going to prepare from scratch. You can even process the entire tomato sauce in your food processor if you don’t want any chunks of tomatoes at all, which will give you a very fine and smooth puree of sauce if that is what you like. I didn’t remove the skin or seeds of the tomatoes, as the seeds and skin of the tomatoes are very healthy. So this is a homemade tomato sauce recipe with skin and seeds of the fresh tomatoes. However, you can tweak the recipe and remove the seeds and skin of the tomatoes if you wish. You could try this food mill if you wish to puree the sauce as well as remove the seeds and skin of the tomatoes. Whatever is the texture you like, the basic thing is that we prepare this homemade pasta sauce using fresh tomatoes and our favorite spices and this homemade pasta sauce using fresh tomatoes is really easy to make and it is so yummy to pour over any kind of pasta or your favorite spaghetti. This homemade pasta sauce using fresh tomatoes is perfect for spaghetti recipes so this is also the most easy homemade spaghetti sauce recipe using fresh tomatoes from scratch. If you have fresh tomatoes and spices at your home, you don’t have to worry if your pasta sauce is over. You can use this homemade pasta sauce using fresh tomatoes in places of spaghetti sauce with tomatoes, marinara sauce for pasta or any recipe that calls for adding fresh tomato sauce for dressing or flavoring. I used turmeric powder and red chili powder in this homemade spaghetti sauce recipe, as spices are healthy and add exotic flavors to the dish. Feel free to experiment with your own favorite spices and enjoy the exotic flavors! 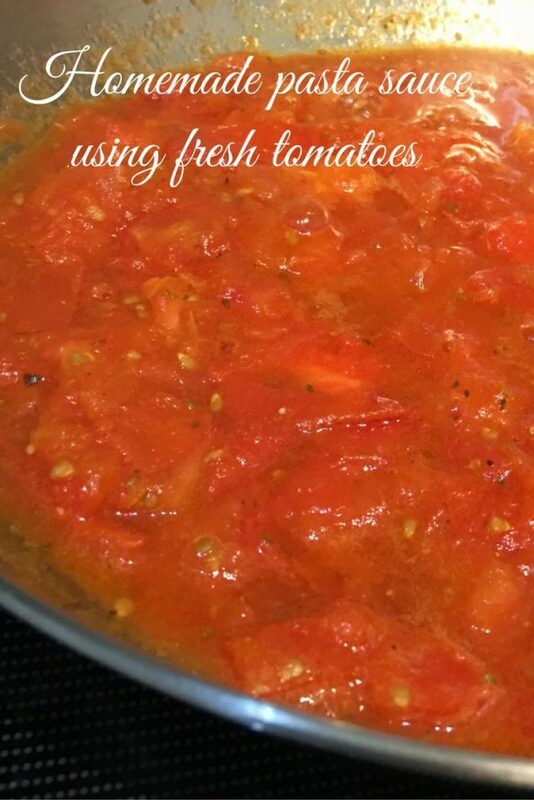 So here is how you can make this easy homemade pasta sauce using fresh tomatoes. This homemade pasta sauce or spaghetti sauce recipe from scratch using fresh tomatoes and spices is very easy to prepare and delicious too. Cut the tomatoes into small pieces and keep aside. Heat olive oil in a pan and add the crushed garlic, saute for 1 to 2 minutes. Add the tomatoes and water, keep the stove in high heat and wait for the water to start boiling. As the water starts boiling, add salt and sugar, gently mix everything, reduce the heat to low. Let the tomatoes get cooked in low heat for about 10 to 15 minutes, stirring in between to make sure the sauce is not getting burnt at the bottom of the pan (Keep the pan open while the tomatoes are getting cooked). 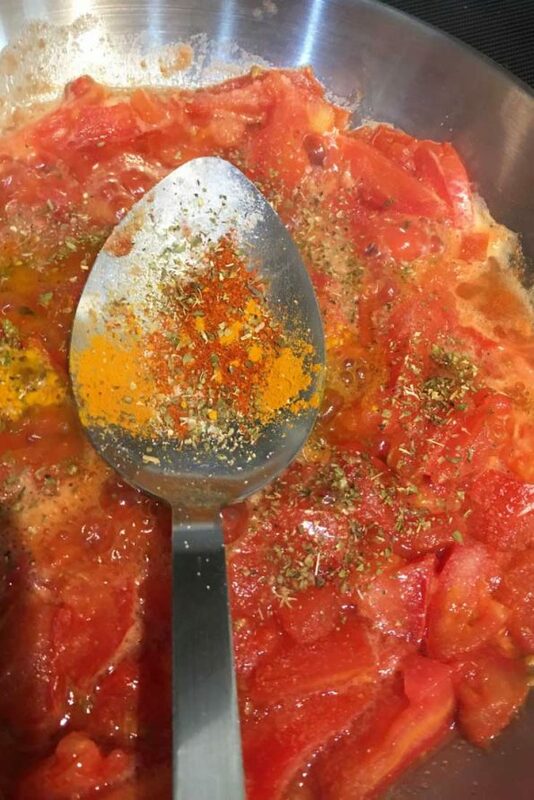 After 10 to 15 minutes, the tomatoes will be cooked and soft, you can gently mash them using a spatula or spoon. If needed, you may add a little more water and olive oil and cook the tomatoes for more time until the tomatoes are really soft so you can mash them really well using a spatula or spoon. Now add all the spices to the tomato mixture and mix well, and cook for another 3 to 4 minutes or until everything is well combined and the mixture has reached the consistency of sauce. 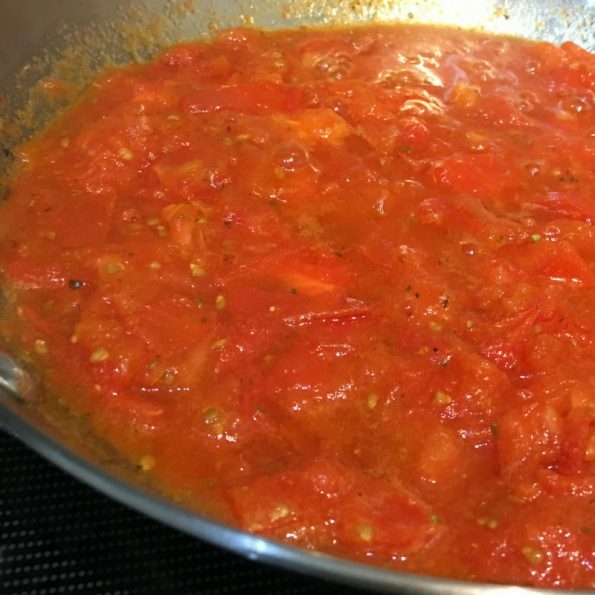 Your homemade pasta sauce using fresh tomatoes is ready to be used and you can mix it with your cooked pasta or spaghetti or you can pour this hot tomato sauce over any pasta or spaghetti, sprinkle cheese and enjoy! You may adjust the spices a little and may add your favorite ones and experiment with different flavors if you like! This homemade pasta sauce recipe or homemade spaghetti sauce recipe using fresh tomatoes have chunks of tomatoes and not very smooth consistency. 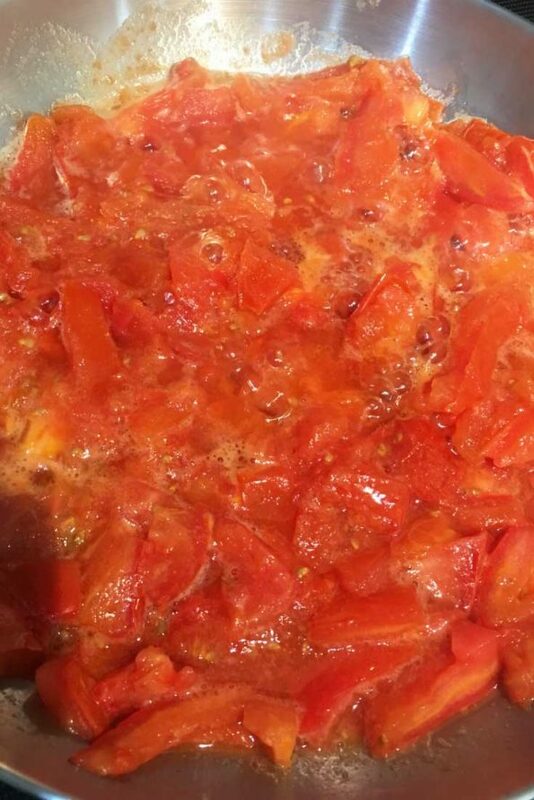 As I mentioned in the beginning, for a smooth consistency you can either puree a couple of tomatoes and add it along with the pieces of tomatoes while they are getting cooked, or you can puree the entire thing in a food processor if you want a pasta sauce of very smooth consistency. I love the chunks of tomatoes in the pasta sauce or spaghetti sauce, so I usually don't puree it, but its really your choice and in both ways this homemade pasta sauce using fresh tomatoes is delicious and easy to be made from scratch. If you wish to add onions to the sauce, you can chop a large onion finely, add it in the beginning after you add the garlic, then saute it until its transparent or lightly browned and then add the tomatoes and water and proceed with the rest of the recipe as instructed. To make it even more easier, you can add store bought dried onions (dry minced onion flakes) and lightly fry it easily in the beginning or even use onion powder to just add the flavor of onions easily in the pasta sauce. Like the looks of your recipe going to give it a whirl. Would have helped if I knew what amount of sauce made. But will soon find out.. thanks for posting. Thank you Michele! I have updated the servings for the sauce in the recipe card. If you make this, please let me know how it turned out for you. Would love to hear. Thanks again. Recipe Garden is a vegetarian food blog with easy vegetarian recipes (may also include some egg recipes) including easy instant pot vegetarian recipes, South Indian style vegetarian recipes, Kerala recipes and easy vegetarian recipes (and many vegan recipes too) from other parts of the world as well. Recipe Garden is a participant in the Amazon Services LLC Associates Program, an affiliate advertising program designed to provide a means for sites to earn advertising fees by advertising and linking to Amazon.com.